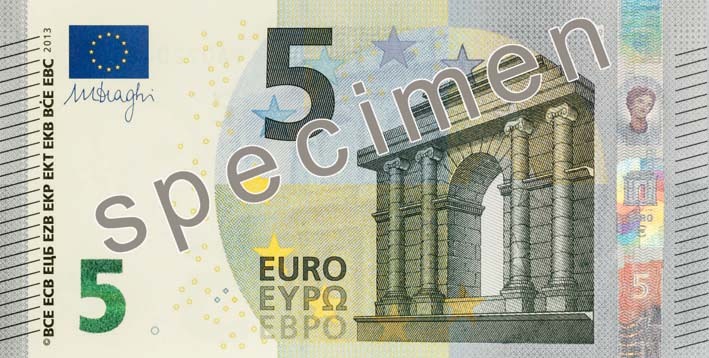 On 10 January 2013 Mario Draghi, President of the ECB, unveiled the new 5 Euro banknote at the Archaeological Museum in Frankfurt am Main. 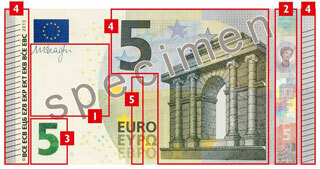 The 5 Euro banknote is the first banknote in the Europa series introduced and issued on 2 May 2013 across the euro area. On the front, there is a series of short raised lines on the left and right edges. The main image, the lettering and the large value numeral also feel thicker. A faint image becomes visible and shows a portrait of Europa, the value of the banknote and a window. The security thread appears as a dark stripe. The ˆ symbol and the value of the banknote can be seen in tiny white lettering in that stripe. The silvery stripe reveals a portrait of Europa – the same one as in the watermark. The stripe also shows a window and the value of the banknote. The shiny number displays an effect of the light that moves up and down. The number also changes colour from emerald green to deep blue.